PZ Gallery, Penzance. November 2019. Harberton House, Kingsbridge. Devon Artists Network group show. April/May 2019. Delamore, Stables Gallery. Group SWAc show. May 2019. Home Naturally, Interior Design Shop, Bovey Tracey. Ongoing. Helens Clothes and Contemporary Gifts Shop, Shaldon. Ongoing. Thelma Hulbert Gallery, Honiton. Group SWAc show. February 2019. As part of Devon Open Studios, 1 Hawkmoor Cottages, Bovey Tracey, 2018. 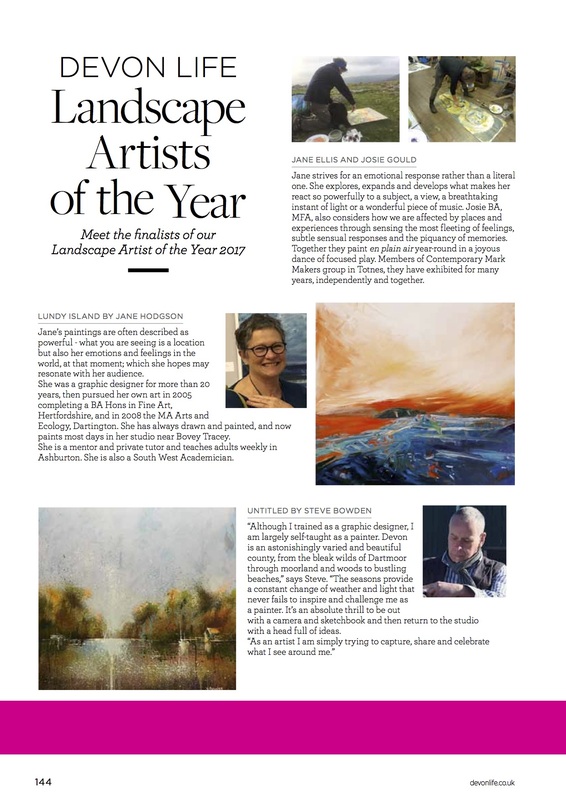 What an honour – I was a finalist among 5 other artists for the Devon Life Landscape Artist of the year, 2018. I didn’t ‘win’ but hey, that’s ok!! 13 January – 24 February 2018. Thelma Hubert Gallery, Honiton. SWAc exhibition. Easter weekend, 30 March to 20 April 2018. The Mayne Gallery, Kingsbridge. I am one of 6 artists showing 3 works each, from which the winner will be chosen. (I think we are all winners to have got here!). 9 September – 7 October. Devon Open Studios, my home studio – Saturday 9 – Sunday 24 September 2017, at my home studio. See catalogue for times I am open, or contact me. The Observatory: perspectives on landscape, society and spirit. 11 – 18 June 2017, 10am – 5pm, The Forum, University of Exeter, EX4 4SZ. 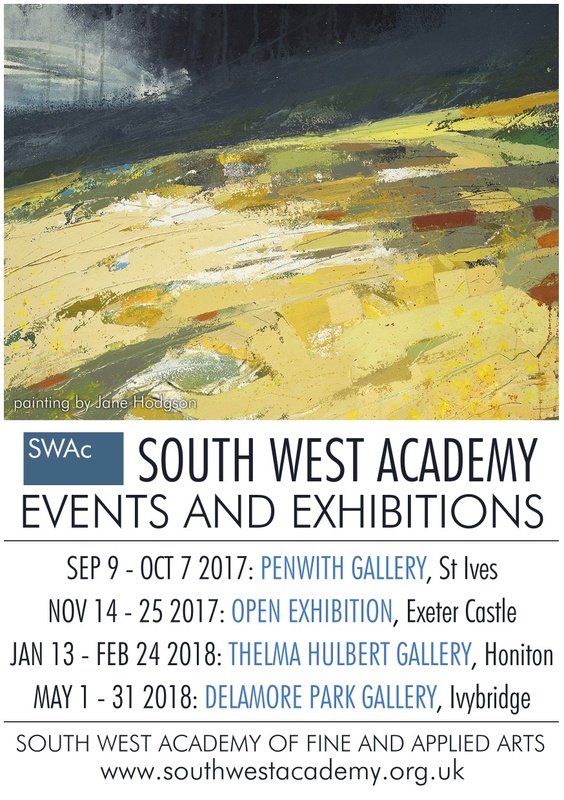 South West Academy Exhibition, Delamore Park Gallery, Delamore House, Cornwood, Ivybridge PL21 9QT. This show coincides with the Delamore Open Exhibition in the main house. 1-31 May. 10.30 – 4.30 daily. 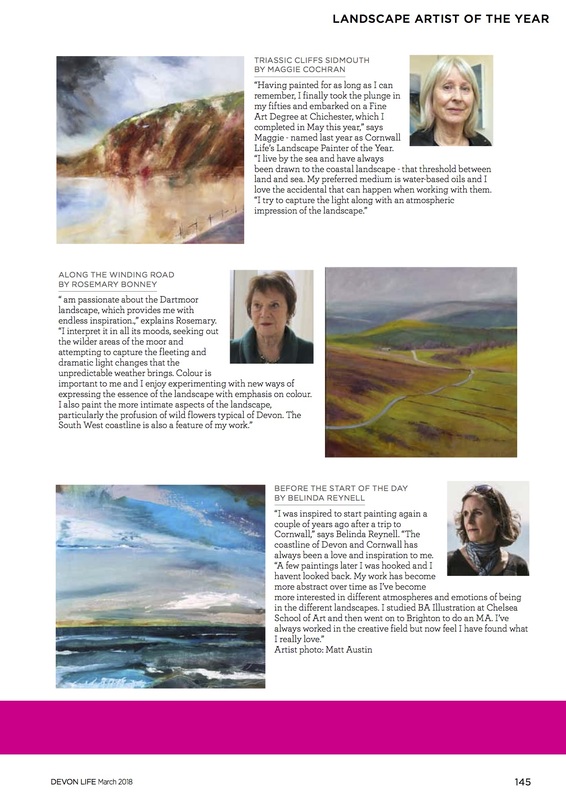 Devon Open Studios – 10 – 25 September, at my home studio. See catalogue for times, or contact me. Devon open Studios at my home studio. New Zealand Oils, Group show, part of the Helios Group of Artists, Gloucestershire. New Zealand Oils, Group show at Avon Mill Gallery, Loddeswell, Devon. Town Hall, Bovey Tracey, Devon. The Six of Us, Courtyard Arts, Hertford, Herts.